The Fidelio Incident does little to stand apart from its contemporaries. An interesting story with some beautiful scenery, but let down by half-hearted puzzling and some derivative story beats. I live in a city, so I can't readily go on a quiet, contemplative journey of self-reflection. I'd get partway through an abstract metaphor for my deepest regrets, only to step in the remains of a half-finished chicken caesar wrap. Videogame protagonists have a better time of it, as evidenced by a growing number of first-person games that use a remote, isolated environment—often with a cave—as a canvas to tell more personal stories. The Fidelio Incident is the latest such game. (Yes, there's a cave.) It begins with a plane crash over Iceland. You play as survivor Stanley, and must search the strewn wreckage of the plane looking for Stanley's wife, Leonore. She's still alive, and, while you can't converse, she can talk to you via a damaged radio. As you make your way up the mountain towards the black smoke at the top, Leonore asks you to find the pages of her diary so as to hide your true identities before rescuers arrive. And so, the mystery unfolds, page by page, as you traverse the frozen wilderness. It's a beautiful environment, but deadly. Hypothermia sets in quickly, shown by ice crystals forming at the corner of your screen. Stay out in the cold too long and you'll die, so Stanley must move between heat sources—steam pipes, geothermal geysers and bits of burning fuselage. It doesn't quite work as a system. Die, and you simply respawn at a nearby heat source to try again, undercutting any real sense of danger. The Fidelio Incident is linear, but some light puzzling means a few areas open up—forcing you to work between heat sources to find diary pages to progress. Later, you'll find valves and levers, and must redirect steam pipes to clear swarms of insects. The simplicity of these puzzles makes them feel like busywork designed to pad out the couple of hours The Fidelio Incident takes to complete. The mountain becomes increasingly weird and unsettling as you progress towards the top, becoming a reflection of the personal demons of its protagonist. Much of the backstory is filled in by Leonore's diary, the majority of which concerns republicans in Northern Ireland during the '80s. What exactly Stanley and Leonore are running from forms the crux of The Fidelio Incident's emotional payload, but it's not a spoiler to say that the main character is carrying some major baggage. As is often the case with this type of game, while the setting can feel dangerousand fantastical, the underlying story is more personal and real. I enjoyed the story, and especially reading about the early interactions between Stanley and Leonore, but the more abstract elements worked less well. 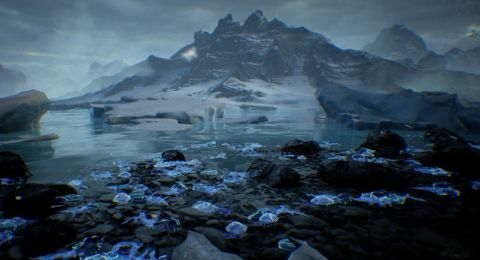 I couldn't help but recognise the template set by The Fidelio Incident's genre forebears, most notably Dear Esther. While some abstract sequences are a little more out there—is the mountain a metaphor?—the broad emotional journey hits many similar notes. The Fidelio Incident is beautiful and introspective, but leans a little too heavily on the genre's now firmly established cliches.